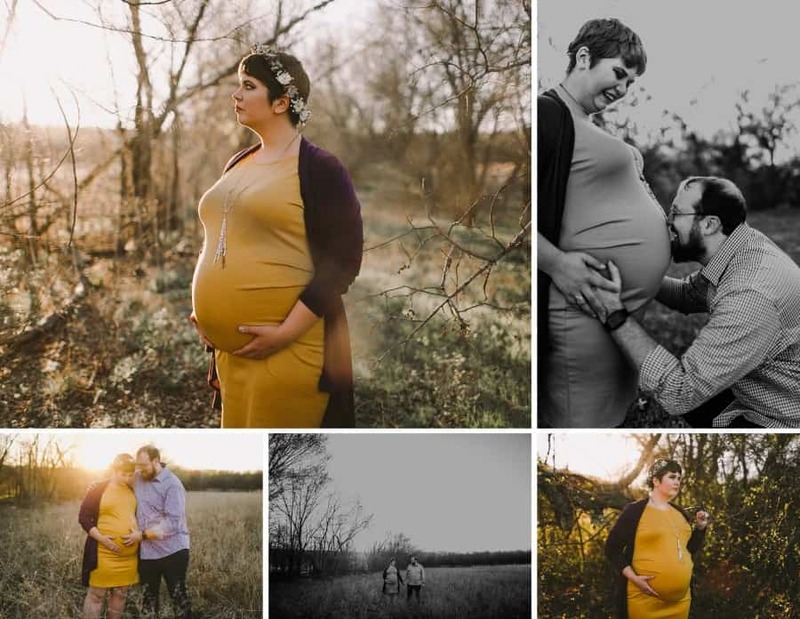 Kinzey and her husband didn’t just think outside the box for their plus size maternity shoot. 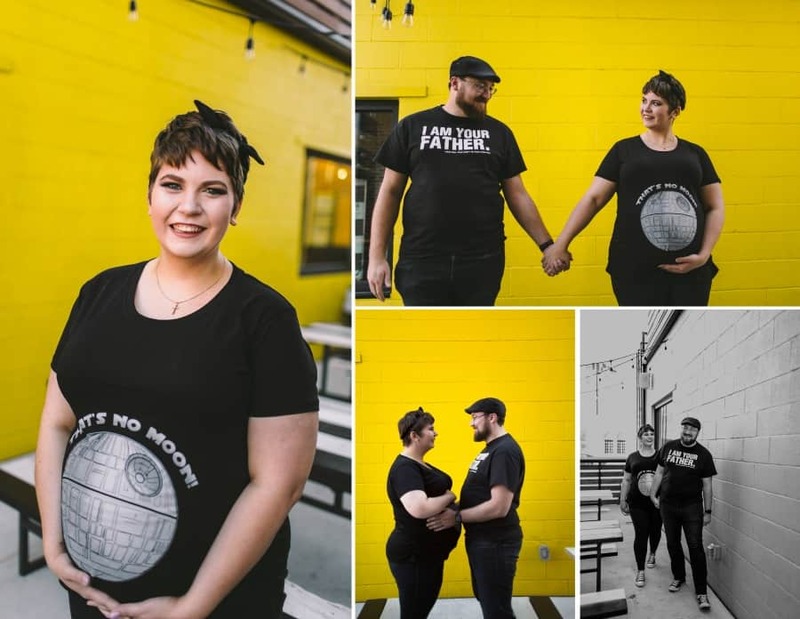 They took the box outside the universe with their Star Wars maternity shoot! Then they brought things down to earth with a lovely photography session outside. 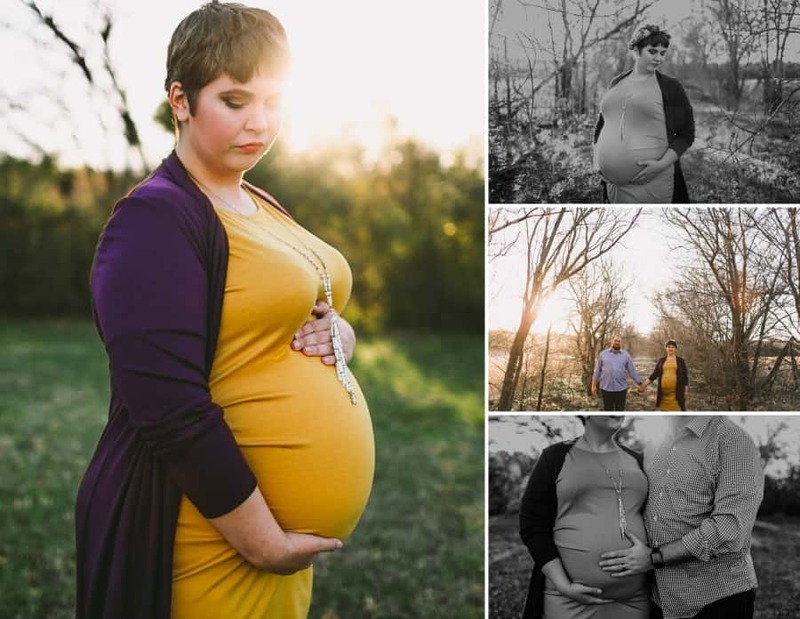 Kinzey was all about going down a journey to embrace her plus size pregnancy and rocked a yellow fitted maternity dress for the second session. I hope you’ll enjoy her story and these wonderful photos! 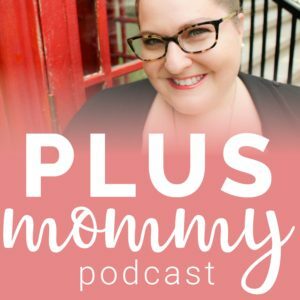 Being “plus size” isn’t always easy, especially when you are pregnant. My self-esteem hasn’t always been the greatest, but over time, I’ve learned to embrace my curves a little more through this pregnancy. I would like to say that it’s been an easy pregnancy, but it has really been a roller coaster, especially around the 27-week mark when I tested for gestational diabetes. My levels were not where I wanted them and if I want to have the natural birth I’ve dreamed of, I would have to make some changes to my diet. I had to watch what I ate and cut out sugar and carbs and then continue to prick my finger to monitor my levels. For the most part, it wasn’t too hard, but being a Texas gal I love my sweet tea and bread, so it hasn’t been easy to restrain myself from the things I love most. But, it was for my little blessing growing and kicking in my belly. I watched my levels and ate healthier, but at my next appointment, I got another blow when my fundal height increased 5 cm in two weeks. Honestly, I felt like a failure and that I was letting my baby down. My midwife scheduled a sonogram to see what’s going on. Was it just a growth spurt? Was it too much amniotic fluid? It took about a week and a half before I found out, and fortunately, when my midwife measured my fundal height again it was right on track. It was such a sigh of relief. I continue to watch what I eat. Some days my levels are better than others, but I’ve found some meals that I’ve repetitively eaten and enjoyed. So, like I said before I haven’t had the best self-esteem. But, I know motherhood has been something I’ve looked forward to since I was a little girl myself, so I wanted to capture this moment in my life. I’ve used the same amazing photographer, Asia of Photobyjoy, for my engagement and wedding photos, so I couldn’t imagine anyone else to take my maternity pictures. I feel it’s important to find a photographer that can make you feel really comfortable, that’s open to different ideas and has an eye for unique shots. The hard part was figuring out something to wear. 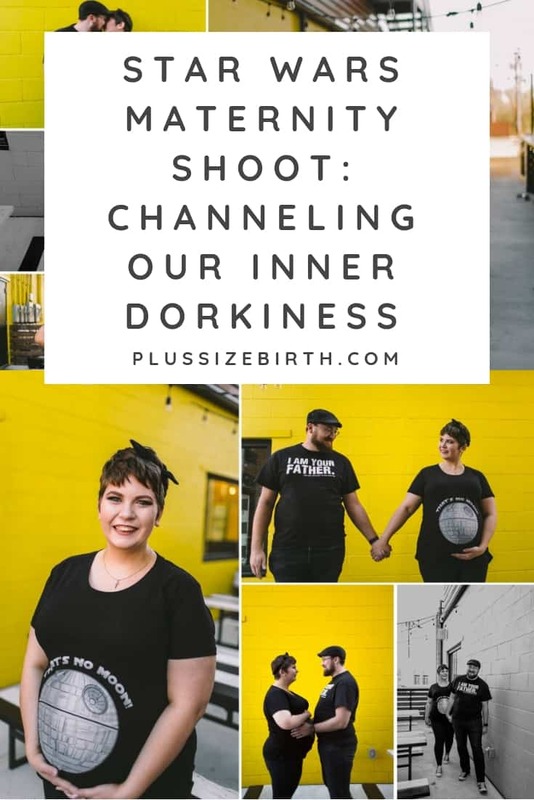 I had such mixed emotions on what to wear for our maternity photos. I knew for the first outfit, I wanted something to really represent us as a couple and future family of three. My husband and I are both really nerdy. We enjoy going to comic and gaming cons, play board games and geeking out to the latest Marvel or Sci-Fi movies. 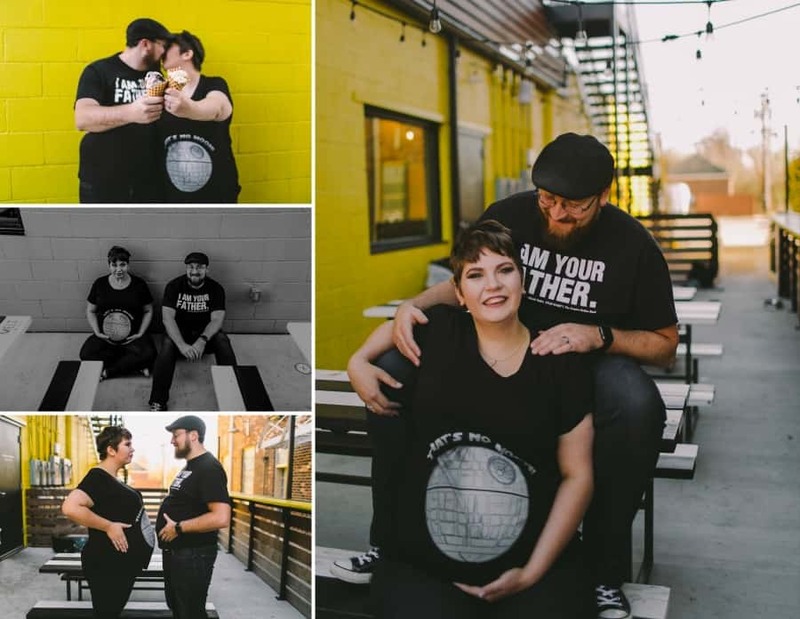 We did our Star Wars maternity shoot at Melt Ice Creams in Fort Worth. And because I’m still staying off sweets, I do admit the ice cream was a little staged, but my husband didn’t complain because he got to eat both the cones. But, Melt’s ice cream is so divine and hopefully sometime after our little one is born I’ll be able to self-indulge a little again. 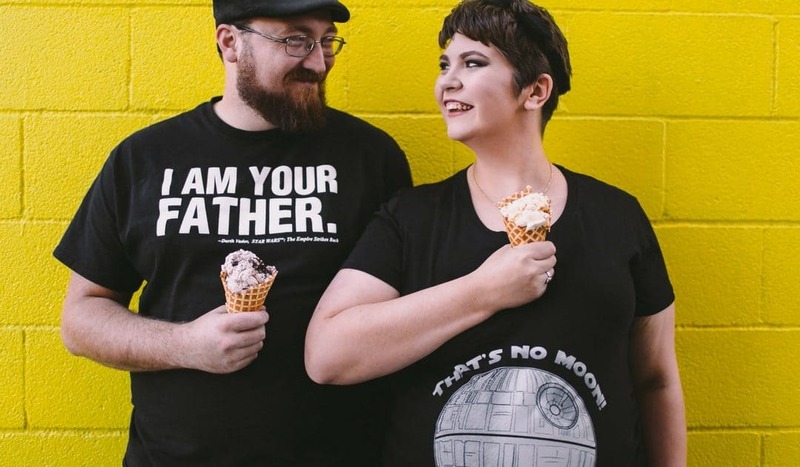 Recreate this Star Wars maternity look with these plus size Star Wars t-shirts! I also wanted something outdoors too and a bit more colorful. that seem to naturally blow in the wind, but I saw this dress on Pink Blush Maternity and I fell in love. Being pregnant is probably the only time I’m truly accepting of showing off the belly. I admit I was a little self-conscious because I would never wear anything so clingy if I wasn’t pregnant. But, pregnancy has really taught me to embrace my ‘B’ belly and just going with it. It’s the greatest blessing of all to have life growing inside of you and I’m really glad I did these pictures to show it off. Recreate this gorgeous plus size fitted yellow dress look! I am plus size and pregnant and I’m loving every bit of it. Somedays I feel better about my body than others, but after looking through these pictures it gave me a sense of empowerment and I felt truly beautiful. It also helps to have an incredible, supportive partner that tells me how gorgeous I am everyday, even when I feel like a whale at times. I am so blessed to have an amazing husband who has been so helpful and wonderful from putting on my shoes to writing a lullaby to his first child. I’m so glad these moments were captured right before we become a little family of three. This photography session gave a sense of accomplishment. I’m working on making this a healthy, plus size pregnancy. I encourage plus size moms to embrace the bump and tell their story through photography by capturing such a precious moment in their lives. I’m so grateful to have done these maternity photos and to be able to share them with my daughter. I have dealt with so many pregnancy’s, let alone plus size pregnancies as a hypnotherapist, so I love to see posts like this. Yea, you “Are The Father” 🙂 I’m happy for you!